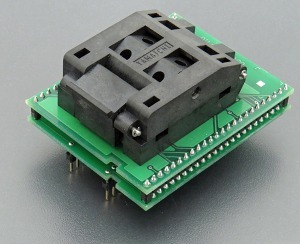 Protect the pins of adapter and adapter's ZIF socket from contamination. Don't touch the pins with bare hands. Any dirt and/or fat may cause errors during programming. Usage of vacuum pick up tool is expected for device handling. Proceed with care! Incorrect insertion of adapter in programmer's ZIF socket or device in adapter's ZIF socket may lead to programmed device damage. Insert converter to the device programmer ZIF socket according to the picture placed near of it. If you have some doubts about orientation of this converter in device programmer ZIF socket, it is valid general rule, the orientation of the text of title is the same as the text on the top of the device programmer. Open the converter ClamShell ZIF socket. Insert the device into it (place device on contacts). The right position of the programmed device in converter ZIF socket is show at picture near (mainly left above) the converter ZIF socket. On this picture reference corner (e.g. position of pin 1) of device is indicated by dot, by number 1, by bezel or by any combination of them. Visual check interconnection between device and converter ClamShell ZIF socket. If everything looks OK, close it and now, device is ready for programming. Be careful, because the incorrect insertion of converter to the device programmer ZIF socket or device to the converter ClamShell ZIF socket can damage the programmed device. To take out the device, open converter ClamShell ZIF socket and remove device from it. When you finish work with converter, remove it from the programmer ZIF socket. Do not directly touch the pins of the converter and converter ZIF socket, because dirt may cause errors during programming of device. Operation conditions: operating temperature 5°C - 40°C (41°F - 104°F), operating humidity 20%...80%, non condensing.